I've got a 1988 TRX350D that is making a popping noise in the front end. I jacked it up this afternoon and it's silent when turning the handlebars back and forth. But when I rotate the wheels it pops a little. When driving it straight forward it sometimes makes a slight pop and then stops. But when driving it forward with the wheels turned it is loud and constant. 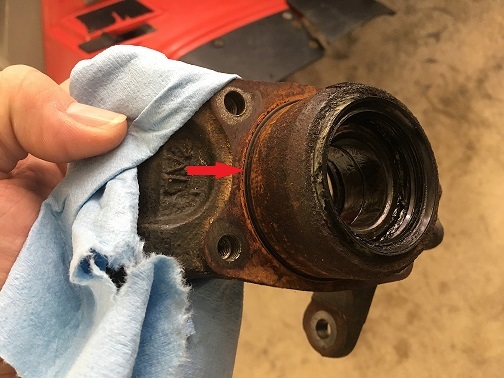 What are some common failure points on these that may cause this and can you still purchase new front end parts for them? welcome to the forums. common problem, your front cv-shafts are worn badly. Great, I'll check them out. Are new ones still available? New OEM are no longer available. Ok, thanks. I guess I will try some of the aftermarket ones then since it's hard to know what you're getting with used ones. My dad bought it new but it has been retired to backup duties around the farm for the most part. It has been one tough machine through the years and I still use it some during hunting season, so I'd like to fix it. I'm decent at turning wrenches on autos but have never worked on an ATV much. Are there any how-to's floating around on switching the axles out on these models? I've come across some on the newer ones, but not these. See of powersportsnation.com has used OEM. They will be of better quality and PSN has a 30 day guarantee on used parts. I haven't torn into a 350D front end yet. @shadetree can tell you though. With hunting season in the rear view, I'm gearing up to replace the front CV axles. What all else should I replace while I have it apart? I see there are 2 seals on the knuckle (inner and outer), should I plan to replace those? What about the brake drum seals and orings? To my knowledge it has never been apart, so no telling what I'll find. Speaking of brakes, I see Honda has discontinued a lot of those parts as well, including the shoes. What are some good aftermarkets and are there any good online aftermarket parts dealers? I'm limited to dealers and salvage yards locally. That shows it next to the hub as if it goes on the hub, but there isn't an oring there. 64.6mm x 1.3 is about right on the size, so I think that's it but wanted to confirm with those of you more familar with the bike. I might could use gasket maker instead, not sure.